Samsung holds 2011 dual-core chip crown; can it repeat? Only 20 percent of smartphones sold last year had dual-core chips, but among those, Samsung sold the lion’s share of silicon. Research firm, Strategy Analytics, shared the data on Wednesday, estimating that Samsung held 60 percent of the dual-core processor market in mobile devices. Even in the face of new quad-core chips this year, dual-core devices will be the big sellers in 2012, but Samsung may not keep the top spot. 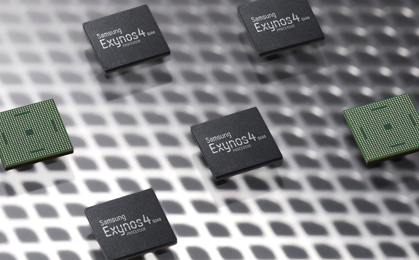 The likely reason for Samsung’s success is that it builds its own processors. And over the past two years, Samsung has quickly moved up the smartphone sales leader board with its Galaxy series of phones. Just yesterday, IDC reported that Samsung took the top spot for smartphone sales away from Apple in the first quarter of this year, moving 42.2 million smartphones vs 35.1 million iPhones(s aapl). Not all those Samsung handsets run on dual-core chips, but many do. I have to wonder if Strategy Analytics will count Apple iPhones in Samsung’s chip sales as Apple designs it A5 chips, but Samsung builds them. If that’s the case, Samsung may well keep its crown because it powers handsets from the top two handset vendors, accounting for the majority of smartphone sales. Strategy Analytics points out that Nvidia (s nvda), Qualcomm (s qcom), and Texas Instruments (s txn) all chased Samsung in market share last year, but Qualcomm is currently best suited to eat away at Samsung’s share; even in Samsung smartphones. Qualcomm is currently the only maker of mobile application processors that support integrated LTE radios. As a result, some Samsung phones that support LTE — such as the Galaxy Note for AT&T(s t) — use a Qualcomm processor. Nvidia purchased Icera in May of last year and expects to support LTE radios with its Tegra chips, but smartphones using that solution may not appear until next year. For now then, only Qualcomm is ready to fight back against Samsung in the dual-chip wars.